Our Our 'mother' company is Shadywood Quilts. I started machine quilting back in 2001 before we moved to Houston. After hand-quilting all my quilts since the late '70's - and after taking that first longarm quilting lesson, I never looked back. While I continued to work at my 'day-job' for several more years, I started quilting for others and eventually added making t-shirt quilts to the line-up in 2006. 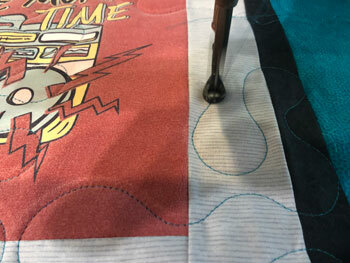 If you are like most quilters, you love to piece those quilt tops but are then faced with the dilemma of how to handle that large quilt in a small home sewing machine.? Hand quilting is one option but that is going to take months and you just don't have that kind of time. Bring us the quilt top (or even a pile of blocks) that your mom or grandmother made. We will provide everything needed to turn those quilt tops or blocks into a treasured heirloom that you will be able to pass down to your family. What is A Quilt Sandwich? What do you need to make a quilt sandwich. Learn about the different layers. Whatever the reason you haven't finished your t-shirt quilt, we can help you get a completed quilt that you will treasure. What do all those initials mean? BITE, BOM, D9P? Learn some the lingo that quilters use. What is batting? Why do we need it? Does your quilt even need batting? You have a tied quilt, it's hard to launder. Maybe consider having professional quilted. We are quilters (since 1978 - when I was just a kid - ahem) and live, breath and sleep quilts! That is a big statement, but rest assured that we take every quilt we receive very seriously. Whether it is your first quilt, a t-shirt quilt, or the quilt of the month. We want you to be a happy quilter, and want you to be happy with what we send back to you. Customer Service is our top priority and we will bend over backwards to make it so!